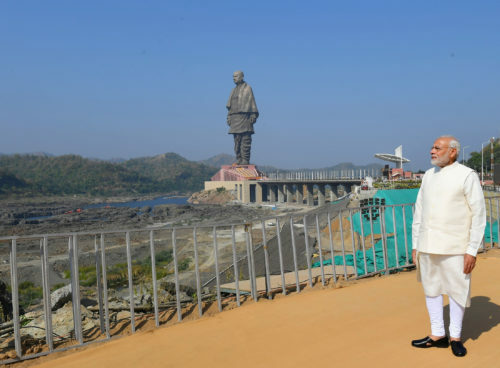 Yesterday, India’s prime minister, Narendra Modi, led the opening of the largest statue in the world. The giant bronze statue honors Sardar Vallabbhai Patel, one of India’s early leaders. The towering 597 foot (182 meter) statue celebrates Sardar Vallabbhai Patel, who is sometimes called the “Iron Man of India”. Before Patel’s efforts to bring the country together, India was a collection of over 500 smaller states, each with its own leader. By getting these states to work together, Patel was able to help India stay together after becoming independent from Britain. 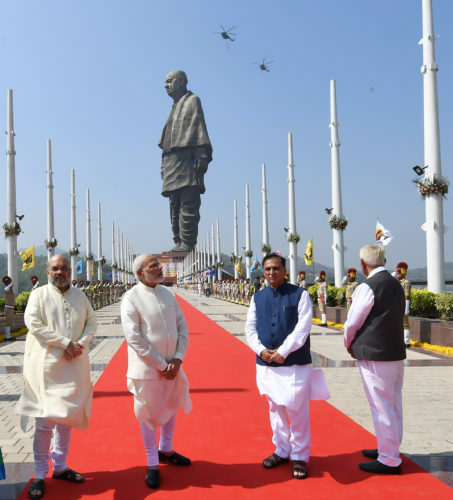 Yesterday, Prime Minister Modi of India (left of center) officially opened the largest statue in the world. The statue celebrates Sardar Vallabbhai Patel, who is sometimes called the “Iron Man of India”. The new statue is huge. Even the toes stand about 10 feet (3 meters) tall. The new statue easily beats the old record holder, the Spring Temple Buddha in Henan, China, which measures 420 feet (128 meters). The statue is twice as tall as the Statue of Liberty, which is 305 feet (93 meters). And that’s including the pedestal that the Statue of Liberty stands on. Comparing the body size alone, the new statue is about five times as tall as Lady Liberty. The new statue easily beats the old record holder, the Spring Temple Buddha in Henan, China, and is twice as tall as the Statue of Liberty, including the pedestal. Mr. Modi has worked hard to bring more attention to Mr. Patel. Since 2014, Patel’s birthday, October 31, has been celebrated as National Unity Day. 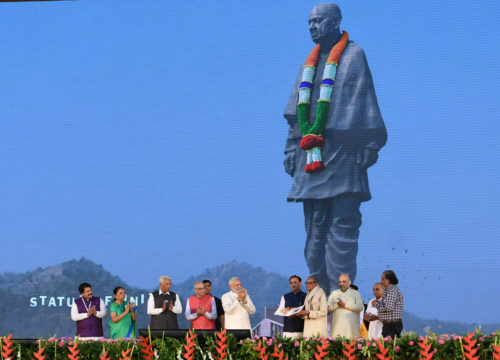 Mr. Modi led the opening of the statue during yesterday’s Unity Day celebration. Mr. Modi’s government spent over $400 million to build the statue. The statue is meant to be able to stand up to hurricane-strength winds and strong earthquakes. Still, many people do not like the idea of the statue. Some people think that the project is a way for Mr. Modi to show off. They think that instead of building a statue, Mr. Modi should have spent the money on things like roads, hospitals, education, or food. Some people say that the project is a way for Mr. Modi to show off. They think the money should have been spent on things like roads, hospitals, education, or food. 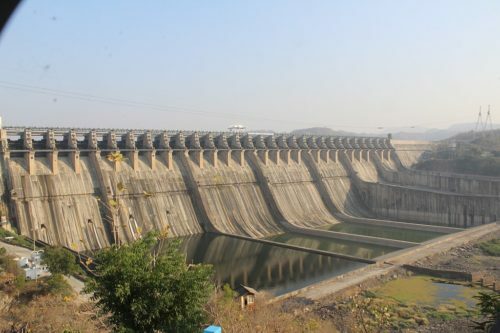 The statue, which looks out over the Sardar Sarovar Dam, is in the western state of Gujarat. Visitors will have to make a special trip if they want to see the statue, since it’s 60 miles (96 kilometers) away from the nearest city. Mr. Modi hopes to turn the area into a tourist site with a museum, food stalls, and gift shops. Visitors can pay to visit a viewing area in the statue’s chest, about 500 feet (153 meters) off the ground. The statue looks out over the Sardar Sarovar Dam in the western state of Gujarat. The statue is about 60 miles (96 kilometers) away from the nearest city. The “Statue of Unity”, as it is being called, is the tallest statue in the world at the moment. But that won’t last long. 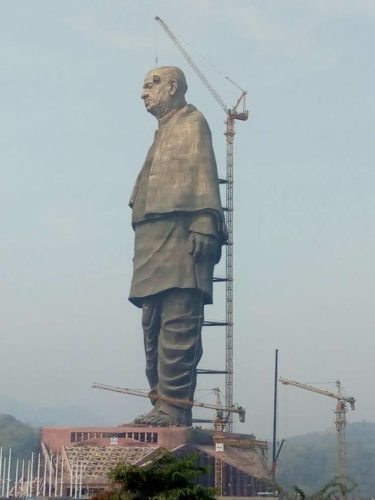 India is already working on another, taller statue that should be finished in 2021. The new statue will be 695 feet (212 meters) tall. Ryugyong Hotel was meant to be the world’s largest hotel. 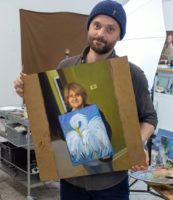 But after more than 30 years, it’s still unfinished. Now the building is being used as a huge screen to show positive messages about North Korea. On Tuesday, hundreds of thousands of women joined together to create a “Women’s Wall” – a human chain that stretched 385 miles (620 kilometers) in the Indian state of Kerala.